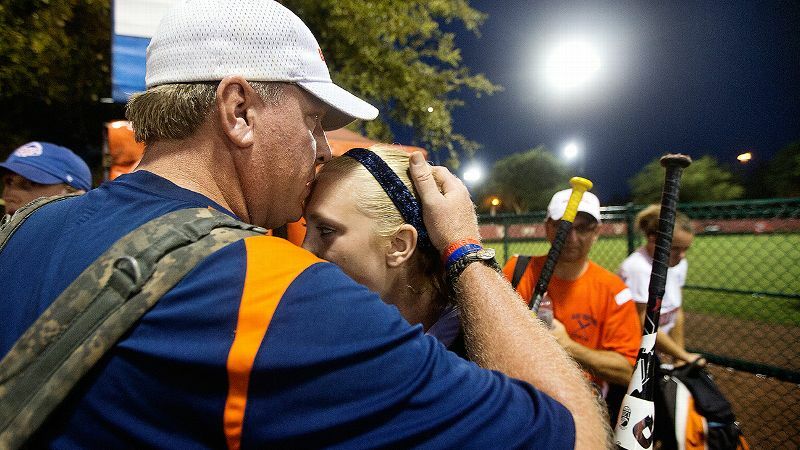 Curt Schilling kisses his daughter, Gabby, during the USSSA Girls Fastpitch World Series in August. Thanks to the unlikely arrival of retired pitcher Curt Schilling, there is now a spotlight on the kind of abuse many women endure as they participate in social media. Women themselves have been trying to turn that light on since the early days of the listserv, but Schilling walked over and found the switch right away. In case you missed the initial story, Schilling's daughter was mortified after he sent out a congratulatory tweet on Feb. 25 once she made her college decision. Not so much because dads are inherently embarrassing, but because of the threats of sexual assault and abusive tweets regarding his daughter that were sent to Curt Schilling in response. "My daughter was devastated the first day this happened," Schilling, the ESPN analyst and former Red Sox pitcher, told espnW. "She thought this was going to ruin her college and she was going to have to go to a different school, and one of the best days of her life got ruined." Here's the thing: Women have always gotten messages like this. But when you fight back, it helps to have a famous name. Schilling, of the forever famous bloody sock, could pick up the phone and get the attention of coaches, administrators and employers. He said he tracked down a number of the men who sent those vulgar tweets and contacted their schools and employers; the Yankees fired one employee who chimed in. Schilling made a great point -- that curbing the anonymous cowboys means connecting some ridiculous fake handle and profile picture with an actual human being. Said Schilling: "People are like, 'Are you going to ruin these people's lives?' and I'm like, 'I don't care.'" Two of the college students were kicked off their hockey teams, Schilling said. He and his daughter got letters of apology from the seven athletes in the group. He said he'll pursue legal options in some cases, considering that his daughter is 17 and some of the tweets are sexual in their violent nature. Schilling wrote a blog about the experience, and this harassment story that every woman with a keyboard knows all too well is suddenly breaking news. The post had over 1 million hits on Tuesday. Schilling understands that this could leave women feeling a little frustrated about not being heard and supported before, but that all of this can stand as a lesson for young men going forward. He totally gets it, he says, but, "Let me just say this, let's not dwell on that one now. I get that you should have been heard before or somebody should have fought for your rights ... but right now this is about going forward." He continued, "Everybody knows you don't talk to women like this. But clearly there is something out there telling them that they can get away with anything they want -- and they can't. You don't have to be a celebrity and you don't have to have money -- you just have to make sure people know who they are." In his blog post, Schilling said his politics and his point of view aren't for everyone. He said that disagreements like that are one thing, but threats of sexual violence should be treated as illegal. For a great deal of people on social media, the abuse that takes place -- threats of harm or violence made against women and men -- might seem invisible as well. But it's there, all right. Here's a great primer on Gamergate, and a Washington Post story about women writers considering retirement rather than deal with Web harassers. And those are just the most visible cases. Plenty of women have had to change their residences after home addresses were published online. But the important idea here is that the virtual world has become the real one. People, the real people behind the words, need to be held accountable for what they write. "It's like the performance-enhancing stuff in baseball," Schilling said. "If you did it once, you might have made a bad decision. But this is a conscious effort and a conscious decision to be really evil." He said he reported the tweets to Twitter "and I got the tweets back from Twitter saying we reviewed it and it's not in violation of our policies, just ignore it. And I'm like -- no." Schilling's anger is so relatable. It would be hard for a parent to hear his description of Gabby's day -- thinking her college career was over before it began -- and not be outraged. Yet here is what's difficult about the reality many women face: Had an unknown 17-year-old called a university herself and contended that a student was harassing her online, would she have gotten the same attention? Would her troll or stalker been kicked off the team? Schilling didn't tell me the names and identities of the men he found, so it was impossible to verify that the correct perpetrator had been linked to a specific tweet. But someone wrote those words, and for Twitter and other Internet companies to treat the digital equivalent of "Fire!" in a movie house as protected speech, under the umbrella of free exchange of political thought, is disingenuous. Violent speech on the Internet should be treated like threats made in any other manner, and it should be wrong across the board. If targets of abuse have to wait until every famous father has this issue intersect with his real life, that's a long wait. In the meantime, Schilling has become the unlikely face of Internet accountability, and a passionate one. "I saw some people said, 'Curt Schilling responded to some Twitter users, and in real life they paid the price,'" Schilling said. "And I'm trying to tell people, Twitter is real life now."